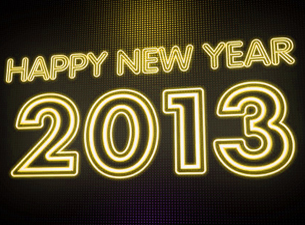 Szczęśliwego Nowego Roku - Happy New Year! New Years Day is for recovery. Whether you partied hard the night before, or not at all, it is a day to relax, “chill,” and just hang out. The comfort of pork and sauerkraut is just perfect whether you will be planted in front of the TV cheering for your favorite team, or enjoying friends and family in some other way. Taking a mid-afternoon snooze would be a luxury! In years past, we’ve often invited friends and neighbors over for Hunters Stew (Bigos), thought of by many as the national dish of Poland. That’s it on the cover of our book and the recipe is on page 45. It’s a delicious stew of sauerkraut, pieces of pork and smoked sausage (kielbasa) and flavored with dried mushrooms, bacon, maybe a bit of apple, and some crushed tomatoes. The beauty of Hunters Stew is that it cannot be screwed up because it doesn’t matter what are the proportions of the ingredients. We use whatever leftover meats are in the freezer, saved for just this purpose. Hunters Stew is best reheated so it can and should be made a few days early when you have more time. Serve it with young boiled potatoes on the side (drizzled with melted butter and fresh chopped dill) and shots of icy Polish vodka or a hearty red wine. OMG – so awesome. 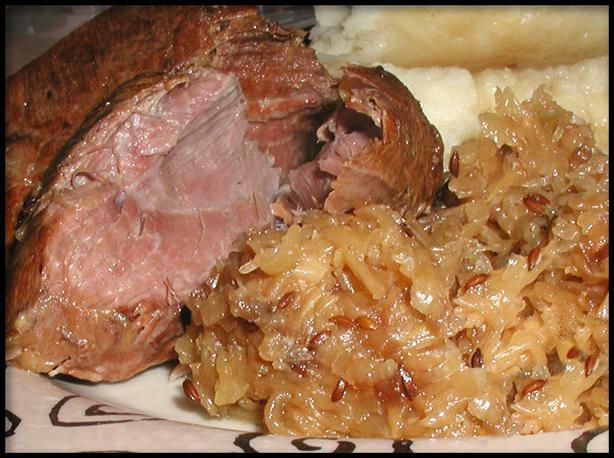 But this year Laura chose to go a slightly different route – a rolled pork loin roast with the sauerkraut – a delicious change of pace. Again, this is one of those dishes you probably can’t screw up, but a few tips may serve you well. The advantage of a rolled pork loin roast (usually seen in two pieces tied together with butchers’ twine) is the thin layer of fat on the roast and often between the pieces that will keep the meat moist. These days pork tenderloins and some center cut chops are so lean that they don’t have much flavor. We’ve been trying to buy pork with the bone in, or at least with some fat on it. A four-pound pork roast will only serve four or five people because it will shrink while cooking. Take a handful of dried mushrooms and rehydrate them in a cup of hot water. Let them sit in the water for at 30 minutes. Save the mushroom water. Open two or three pounds of good sauerkraut and wash it well. Rinsing and draining a couple of times will take away a lot of the sharp briny tang. Set aside. Salt and pepper the roast generously. Heat two tablespoons of cooking oil in a very hot skillet and brown the roast on all sides. Peter controls the roast with two pairs of tongs and not a fork to avoid making holes for the juices to leak. Three to five minutes on each side should give you a nice dark crust on the roast which seals the juices. Set the roast aside. Slice a medium onion. 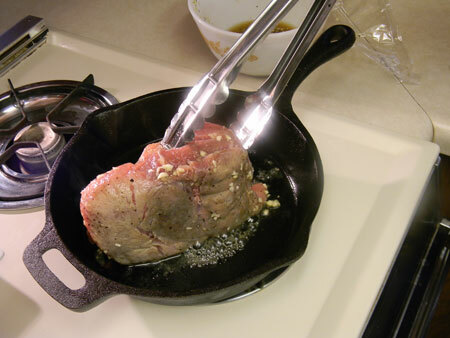 Scrape the skillet with a wooden spatula to loosen the residue from browning. Add another tablespoon of oil if needed and sauté both the onion and sauerkraut in the hot skillet until golden. Add the dried mushrooms and their water, and mix well. Taste and decide how else you’d like to flavor the sauerkraut. For a slightly sweeter flavor add half of a tart apple which has been cut into small slices, and a tablespoon or two of tomato paste. For a more savory flavor, add a handful of sliced fresh dark mushrooms, and a tablespoon or two of caraway seeds instead of the apple. Taste again and adjust the flavorings as desired, keeping in mind that the flavors will intensify as the roast braises. Depending on the skillet you used, either place the roast into the sauerkraut or transfer everything to a small oven-proof braising pan. For the roast to stay moist and braise properly be sure to have an inch of liquid in the bottom of the pan and push the sauerkraut up around the sides of the roast. Braise the pork & sauerkraut low and slow for about two hours at 325°F. Check your pan every half hour or so to make sure it’s not drying out. Add liquid as needed...any good bullion is great. The pork will be done when you stick a fork in it, twist and the meat will be almost falling apart – about two hours. Some more time won’t hurt it but if time is short please be absolutely sure the internal temperature is at least 160°F. Serve with a salad or your favorite fresh vegetables. 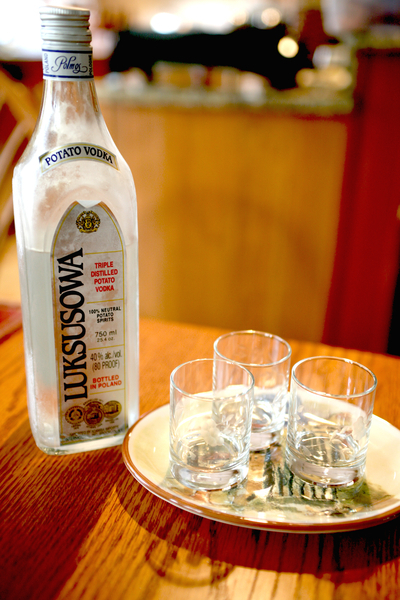 Pair with a nice hearty red wine, European-style beer or icy shots of Polish vodka. 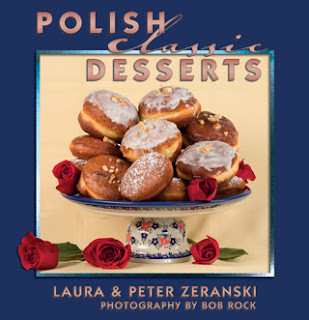 FYI, Polish Classic Desserts will be released around February 15th and it contains amazing photography and awesome classical dessert recipes that have been handed down from generation to generation but updated for modern kitchens. You can reserve your own autographed and personally dedicated copy now (no money due) by clicking on the RESERVE button at the top right. We’ll send you an email on the day the book becomes available.